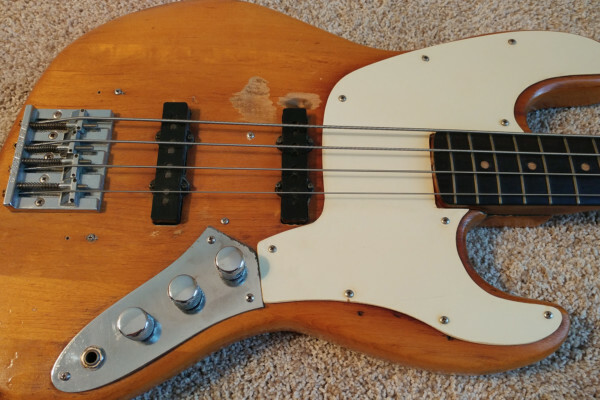 In this edition of Old School, bassist Mike Whited shares his classic 1960’s Kustom Model 200 bass amp, an amp Mike has shared a lot of miles with over the years. Kustom introduced the 200 model as an upgrade to their 100 model amp, offering it in black, blue, cascade, gold, red, white and charcoal. The company later introduced emerald green, and silver with gold sparkle options. Black was the most commonly seen color today. The “Tuck & Roll” reference comes from the naugahyde used to cover the amp, similar to certain kinds of car upholstery of that time. Kustom abandoned the tuck & roll finish in the late 1970’s. We asked Mike to give us the story behind this vintage amp. 47 years. I purchased it new in 1965. I was home from touring for a couple of days in the summer of 1965 and stopped by a Coyle’s Music in Columbus Ohio to pick up some strings and browse. It was right inside the entrance, and I was smitten. I had never seen anything like it. The stock Jensen speakers were replaced with JBL D130’s. The amp is called the “Frankie” (or Frankenstein) because the top of the amp is thicker than the bottom giving it a “Karloff” like appearance. It has the early thin plastic handles, a red power light that in later production was changed to blue and the stove top style control knobs. 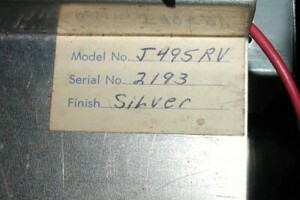 The serial number is hand written and according to the number chart and Vintage Kustom, it is the 193rd one of approximately 110,000 tuck and rolled amps made. The amp has two channels marked guitar and bass. Just the reaction people have to it the first time they see it. It holds true even today. Not anymore that I know of. 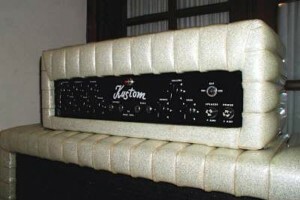 Kustom amps were quite popular in the late 60’s early 70’s though. No, this baby isn’t leaving home. I’m 64. In 1965 (I had just turned 16), my band was contracted as the backup band for a touring rock show called “The Shindig All Star Review.” We traveled to 13 states and three Canadian provinces. We backed Bobby Sherman, Del Shannon and a lot of local one-hit wonders. We toured with the show again in ’67. I’ve also backed Freddy Fender, The Mills Brothers, and opened for the New Colony Six, The Byrds, and Grand Funk Railroad. After I returned home, I left music, went to college, enlisted in the Army, got married and raised two children. Ten years ago I retired and got back into music and am having a ball! I play rock, Motown, blues, bluegrass, country, light jazz, Cajun and Latin. Recently I’ve been backing the Drifters when they come to Ohio. I appreciate the opportunity to share a piece of music history with your readers. 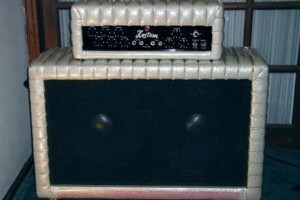 My first serious amp was a black Kustom 200 bass head with 2 dual 15 ported cabinets. I bought it used in 1972 for $400. I let it go through a series of trades with my 2 brothers. It was a great amp! Back in the day, when I roadied for the Soul Messengers, Hardy had a black Kustom setup like yours.. only one of the cabs had a wheel missing.. we carried a brick to put under it. Same brick every gig. Back in the early 70s, I found a 2×15 Black TnR cabinet in Rhodes Music in London. They tried to tell me it had JBLs, but since I had a JBL K140, I knew the difference!! Anyway, I bought it and had it transported up to the north of Scotland via British Rail, and … they bent one of the castors. I wrote to Kustom in Kansas, asking how much it would cost to replace. Next thing I got a call from Customs at the airport, saying they had a package for me … from Kansas, USA!! Yep, a free replacement. It was a beautiful cabinet, and the sound was tremendous. My first real bass amp was a ’73 Charger combo in sparkle Blue. 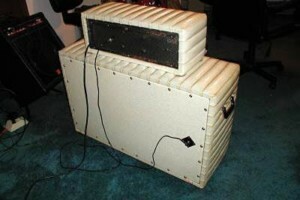 my first guitar amp was a Kalamzoo reverb…ran on tubes, but man did it sound awsome! 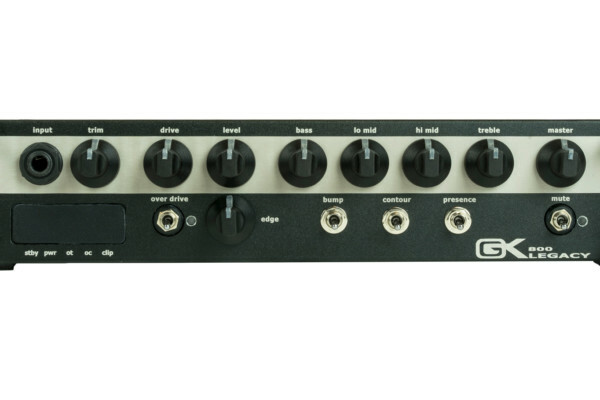 Is the Kustom K200-5 4 channel a bass amp head or a PA head? I think my old band No Consensus used to use one of those for a PA in our practice space. I remember it having 4 channels but also came with two tall cabinets, 4×12 I think? Is the head like really big? Might be worth a visit to vintagekustom.com to see what you can find out. Very Nice. Always wanted one of those wonderful tuck and roll cabs. Classy. Thanks for sharing. M……..
Oh daaaamn, I live Kustoms. I play a Charcoal 1967 K200A1 2×15 tuck-and-roll m’self. A couple friends picked it up at a garage sale in 1997 and I bought it from one of their younger brothers around 2001. Beautifil amp, Mike. Thanks for sharing. Excellent ! Not to many amps have such visual character. Seeing it makes me want to play! Great amps. 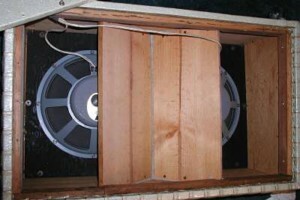 I have a kustom 200 with two cabinets w/ two 15″ jensen stock speakers in each. I play a 1967 gibson eb2dc bass through it. Bought both in 1968. Still have both and they are 100% original and work great. Love each one. Great story, thanks for sharing. I found my dream bass rig after 40 years..200 bass head with a 3-15 cabinet all in great shape , little store in Arkansa , get this whole thing for 295.00 loving it! I’m in a band and only use this for very special gigs I use this rig for bass, the 200 with 2-15 cab for one guitar and a chrger combo for other guitar , the stage looks absolutily bithchen! Nice! My boyfriend “collects” Kustom Kolors. My first amp was a kustom .. I’m 55 and still love my k 100. 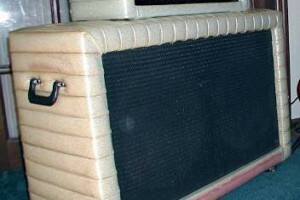 Kustom bass amps were revolutionary in the late 1960’s. Even James Jamerson played one. 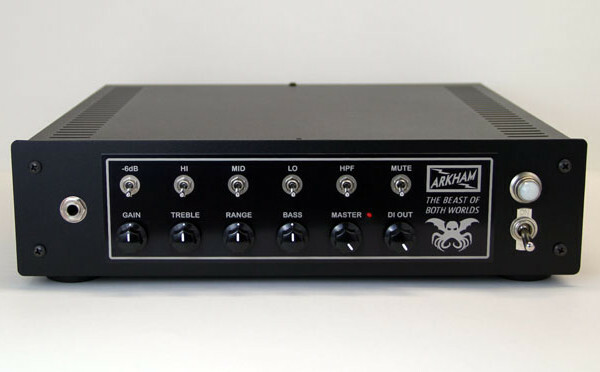 They sounded good and had far more power than most other bass amps on the market plus they were reliable and pretty affordable. Lots of local bands went in hock buying all matching Kustom rolled and pleated naugahyde covered amps in matching colors. They had their day but still a respectable bass amp. I owned a bunch of them and some of them matched my bands.